What are common tree diseases in San Antonio? San Antonio enjoys a fairly impressive variety of trees – unfortunately, this also makes way for numerous tree diseases, each with the potential to cause a tree's premature death. As is the case with humans, recognizing a tree's sickness in its earliest stages is the best way to guarantee recovery, which is why we can never stress the importance of regular check-ups enough. To help you figure out whether your trees are dealing with a disease, here is an overview of some common tree diseases in San Antonio. Keep in mind, though – your tree could have something that's not on this list and there's really no way of telling other than by having our arborist closely inspect the tree for issues. While fungal growth can seem harmless – much more so than a bacterial infection, at least – it's actually one of the most common causes of tree death. While knowing the various types of fungal growth that can affect your tree is a good start, don't tread the wilderness on your own – your best bet is to have our arborist frequently inspect your trees if you suspect they might come under. Let's start with the notorious oak wilt. Known for its lethality, oak wilt is a type of fungal growth that affects a disturbing number of trees and is essentially impossible to stop if left to thrive for long enough. What makes oak wilt so dangerous is that it attacks a tree's water-conducting system without mercy – needless to say, no tree can survive long without getting its basic nutrients, which is why this disease absolutely has to be detected early on if there are any hopes of treating the tree. You should have no trouble detecting oak wilt even if you haven't had experience with it: the leaves will generally assume a bronze-ish appearance or even adopt notable red hues. Since wilt leads to casting, there should be no shortage of fallen leaves around the tree even in the spring and summer – discolored leaves falling to the ground during these seasons is a sure sign that the tree is 'wilting'. Green leaves that appear to be saturated with water is another sign of fungal growth, as we already mentioned that the tree won't be able to distribute water as it should. Lastly, you might also notice discoloration on the wood itself. Grab a branch you feel might be affected and pull off the bark from it – if there is a clear darkening on the wood, your tree is likely suffering from wilt. Part of what makes wilt so tough to deal with is that it starts from the top and works its way down. By the time it reaches the parts of an oak tree that are visible to you, the condition will have usually progressed beyond treatment. 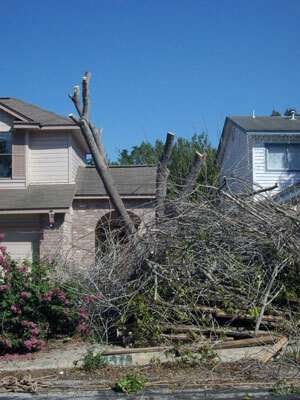 Since timely intervention is key, your best bet is to have our arborist check your trees for wilt on regularly. Other trees in the area that are 'wilting' should be cause for concern, although your tree could just as easily be the first to become infected. Most trees suffering from wilt will die anywhere between a month from infection to around half a year. Therefore, monthly check-ups are your best way to combat this deadly disease. As fearsome as wilt is, it's not the only fungal infection that your tree can come under. Fungal conks are another common issue – while easier to detect and not always as quick-acting as wilt, they're no less lethal if left unchecked. The reason why conks are easier to detect is that they occur in a tree's base rather than its peak. Make sure to check your tree's trunk regularly for any signs of unusual growth that resembles fiber. Since conks will enter through cracks or breaks, make sure to frequently examine the tree's base for holes, tears, cracks and similar issues and call us even if you notice these without the presence of fungal growth. Keep in mind, though, that conks can also appear on dead or broken branches and areas that don't receive a lot of sun. In general, conks are dealt with by removing the affected parts of the tree before they're allowed to spread further, although this isn't always possible – even with a combination of medicine and pruning, your tree might not be able to survive. Aside from starting at the top or around the base, fungal growth can also form on the bark or the shoots, causing discoloration and a giving the area a 'dead' appearance. While your tree might be discolored due to fungal infection, it could just as easily be changing its colors as the seasons pass – only a certified arborist will be able to dispel doubts and tell you exactly where your tree stands. Again like in humans, trees can also fall victim to bacterial infestation during any time of the year, although spring and summer are the riskiest seasons and ones you should watch out for the most. The most common type of bacterial infection on oak trees in San Antonio comes in the form of fire blight. Have you ever returned from a lengthy time away only to notice that your tree seems charred? Unless someone in the area was playing with matches, there's a good chance that it's dealing with this ferocious type of bacteria. Other ways to notice your tree is affected by fire blight is to check the tree's growth – it's not uncommon for affected leaves to turn brown or even black during the spring if they're affected by fire blight bacteria. Similarly, any fruit growing from the infected tree should be smaller than normal and sport a general unhealthy appearance. Later stages of infection can feature fruit that actually leaks bacterial ooze, creating an environment that's not only extremely unsightly but also potentially dangerous. If your tree has been diagnosed with fire blight, your options are limited, although you shouldn't give up hope just yet. Other than gratuitous pruning by an arborist, the application of an antibacterial agent is another common solution that frequently yields good results – if the infection has spread too far, however, you'll have no choice but to cut down the tree in order to prevent others trees in its vicinity from falling victim to the disease as well.